Steel construction - holds boards up to 100lbs! Indoor or freshwater outdoor use! The Suspension SUP Wall Rack is a unique stand up paddleboard wall rack because it will store your board with zero pressure points. Made by Suspenz, this rack includes their exclusive Cradling Strap System (CSS) which is effectively a suspension strap system. These suspension straps conform to your board's geometry and are what allow this rack to not create any pressure points on your board - awesome! What SUPs does it hold? This Suspension SUP Wall Rack also is great due to its heavy duty and powder coated metal frame. The rack's monolithic, tubular steel construction allows you to store SUPs up to 100 lbs! The U-cradle of the rack is 8" wide, so you can store wider touring and race SUPs in the rack, too. Powder Coated Finish. A powder coating on this rack allows you to use this rack for indoor use or outdoor use in freshwater environments. Having a rack you can use in your home, garage, shed, or even on the boat dock is a HUGE advantage. For outdoor storage in saltwater environments, here's a Galvanized Outdoor version of this rack. Safety Tie Down Straps. 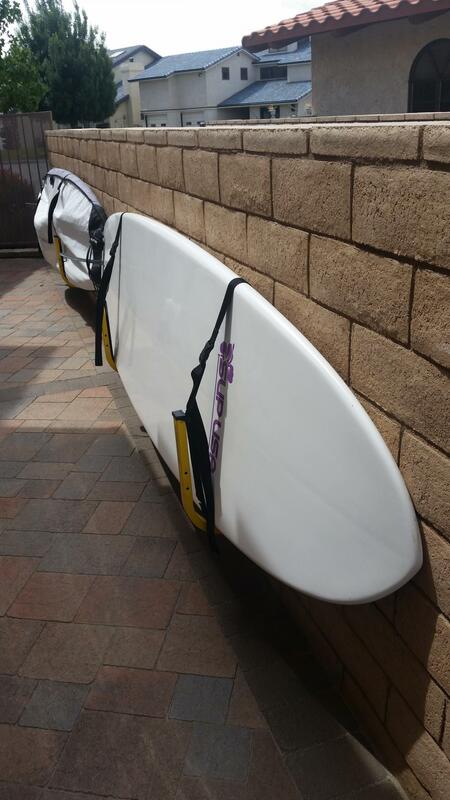 The SUP rack has built in, adjustable safety straps to ensure your paddleboard stays securely in place. This keeps your SUPs secure when they're stored outdoors in a windy spot or if you're afraid someone might bump into your board. Already own this rack and want to expand it to hold 2 SUPs? We offer a complete expansion rack kit to help you do just that! You can also upgrade to these Quick Release Wall Mount Brackets for easier adjustment of your rack's arms! 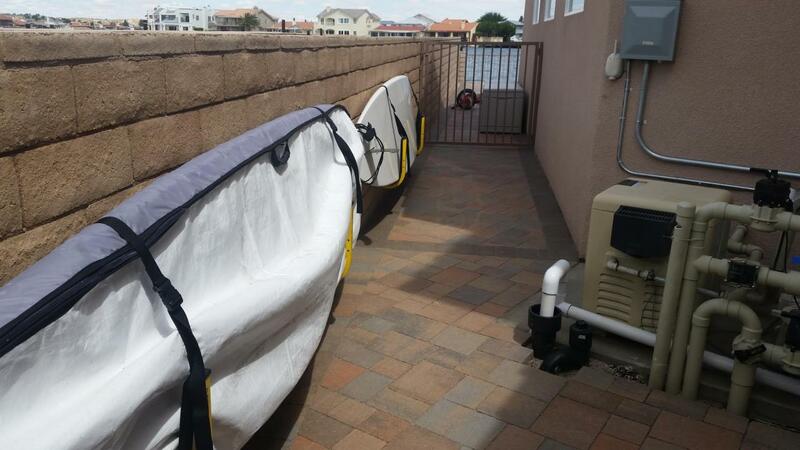 Suspenz is one of the leaders in kayak home storage. 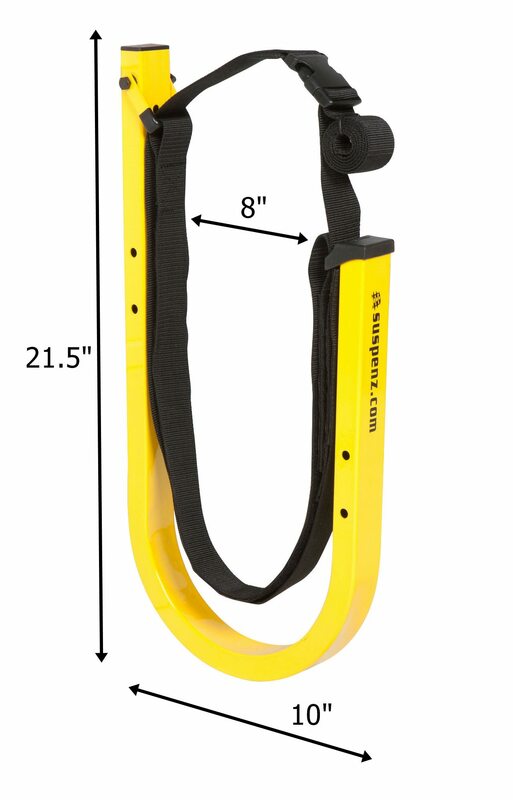 Known for their bright yellow powder coat finish and unique suspension strap system, Suspenz makes a great product at an affordable price. Suspenz's main feature is their Cradling Strap System (CSS). 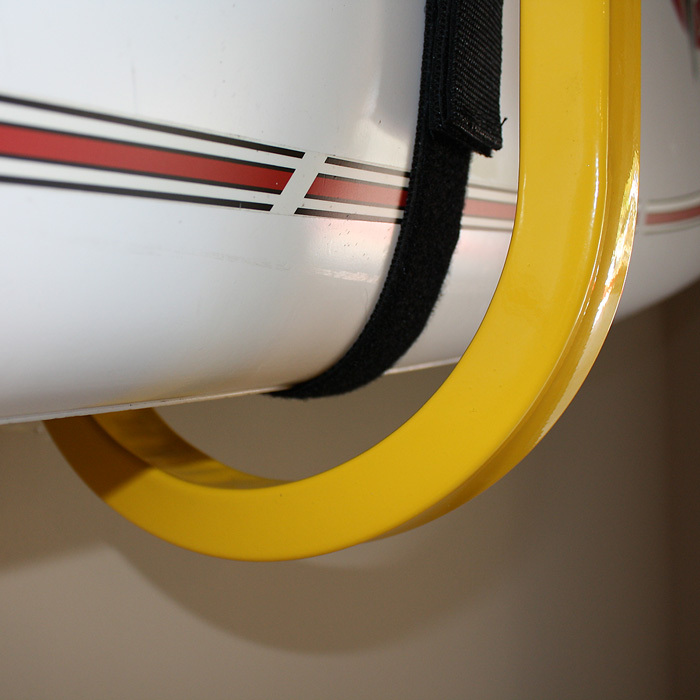 This is a suspension strap system found on most of their racks that ensures there will never be any pressure points applied to your kayak or board. Additionally, Suspenz is known for highly customizable, expandable, and universal storage systems. All Suspenz products also have a one year warranty from the manufacturer. Determine spacing for the SUP racks. As with all Suspenz racks, the ideal spacing is 40 percent of boat length, at least that’s what the engineers say. Always anchor into a wooden wall stud. Use a mounting screw to mark the hole locations. The mounting holes are spaced 4 inches apart. Use a 3/16 drill bit. Soap the screw threads – an old carpenter’s trick. Leaving the top screw loose makes it easy to rotate the rack to find the bottom screw hole. Studs are typically on 16 inch centers. Mount second rack arm at same height as first. Adjusting the rack straps: Undo velcro on the safety strap. Undo velcro on the support strap. Set length so SUP is suspended without touching the arm. Re-attach velcro to position safety strap. Secure SUP with safety strap. With the expansion plate kit, it is easy to add storage for a second SUP. Assembling a double SUP rack. The single SUP configuration extends 10 inches from the wall. The double SUP configuration extends 20 inches from the wall. Hey! This is Josh from StoreYourBoard.com here today to talk about the Suspension Standup Paddleboard Rack. Here it is in front of me alone and here it is on the wall. It does a really nice job of storing your paddleboard. The coolest thing about it is the suspension part, so here is the arm by itself, so you get two of these. You can space them whatever distance you need, depending on the length of your board and where your studs are, whatever firm mounting space you’re going to mount that to, go ahead and line them up. We got to have space kind of in the center that works well, so you got two of those and it’s made from really, really heavy-duty box steel, so this thing is really built tough. It has some nice nylon webbing that is what forms the suspension. This top piece is to kind of strap your board in for extra security, so that’s this part right here. I’m going to undo that quick and the bottom part is what really suspends your board from touching any metal. 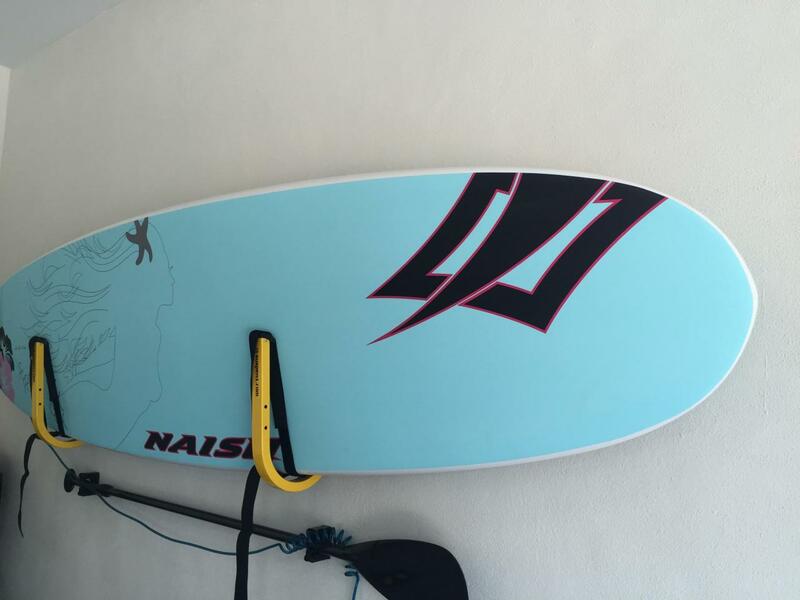 With boards like this, this is a nice fiberglass board, surf-style SUP, pretty expensive. We want to make sure we keep those edges ding-free and this suspension style where the board rests here doesn’t touch any of this metal is really a cool option that a lot of customers like. You get two of these. You get a hardware pack with four nice heavy-duty screws and then you mount it to your wall just like this. Like I said, once you have it loaded in, you can see right down here there’s room that the board is floating in this suspension-wise, so it’s a really great, great solution for that. What you have is with the racks, you got it’s thick enough 10 inches from the wall, so this is 10 inches, so it’s a very compact rack. People love it. Put it against the side of your garage, plenty of room to pull your car in still. Put it in your basement. Put it in your house. It’s a great rack. Inside you got about 8 inches. This strapping is adjustable, so you kind of adjust how far this goes up and down and then with this piece, it adjusts to accommodate different widths of standup paddleboards as well. So you got 8 inches in the center and you got 10 inches out from the wall, very compact. With that, that’s how it works. This board has fins in it. It has about 6-inch fin in it, so just the way it kind of floats you’re able to have it with the front side facing out. You can just easily put your fins with the fins facing out if you have a deep fin, if you have a wide board and that works well, too. Check it out! The Standup Paddleboard Suspension Rack at StoreYourBoard.com. Very well made and easy to put up. Like the way the board is protected by material from the metal frame. I liked it so much I bought a second one. This is a very well made and sturdy when mounted. I like the idea of the board not touching metal, but instead sitting on the straps. Liked mine so much I bought another one. The order was received on time and the product exceeded my exaltation as the build and finish were well done. I will order again from Store Your Board! It would be helpful if the mounting wood screws had a hex nut head so they could be driven into the wood studs using a socket wrench. The U-shape brackets don't allow enough room for a standard drill or ratchet screwdriver based on the length and diameter of the wood screws; it's almost impossible to get the necessary torque to drive the wood screws into the studs. The parts got here in a timely manner, instructions were very clear, easy to install, works like a charm for my 12'6" Focus SUP. Easy to install. Very pleased. First purchase from this company and I'm looking for other products to buy. I really like how the rack cradles the SUP in the straps. I'm not sure I'll use the safety strap over the top as it is very secure without it. I purchased two to mount one on top of each other. Included bolts and instructions were fine. This item is fantastic. 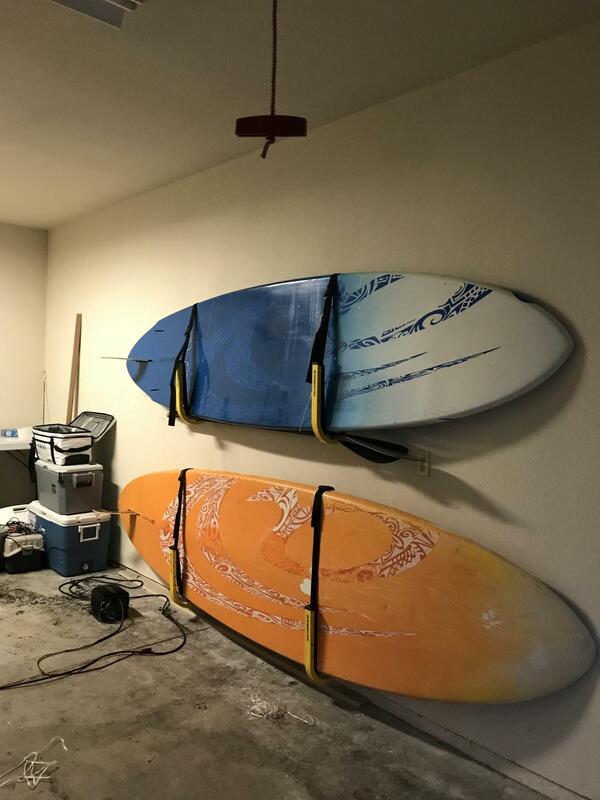 We were able to hang our paddle board on a garage wall and not worry about it being damaged in any way. It is extremely secure on the wall and looks nice. We highly recommend this product. The two SUP Wall Racks ordered arrived promptly. Directions were easy to follow and allowed for quick installation of the racks. Boards slide into the slings and adjustable straps secure them snuggly, suspended from contact with the metal brackets. Perfect storage solution to increase garage space while utilizing unused wall space. This is a fantastic product and was exactly what we were looking for to store our 12ft Porta-Bote that folds up in our garage :) Have to applaud the instructions reminding you to have a "beverage" open during installation multiple times! Only small feedback is perhaps some instructions on how to use the black suspension straps in a little more detail. We struggled with that a bit but eventually figured it out. This SUP Rack is awesome! I mounted it in 15 minutes and my 11 1/2 foot paddle board fits great! The rack is heavy duty and sturdy. I originally was looking for a padded rack but based on many reviews the pads on the outdoor racks deteriorate over time. This suspension is perfect and also holds my board secure for those windy days on the lake. You will not be disappointed! Perfect fit for my wife's SUP. Extremely well built rack. After trying several other storage options, I ordered this suspension wall rack. It arrived quickly and was easily installed. I purchased two of the heavy kayak wall holders to mount above this SUP. Now all three are conveniently stored on the outer back wall of a shed near the lake. 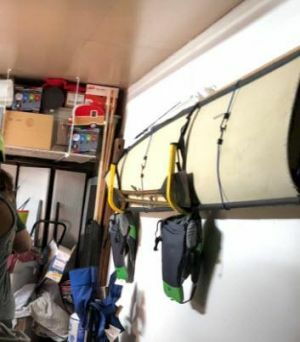 I wanted to hang my paddle board inside instead of the garage. I had a long hallway coming in from the garage that I thought would be the perfect spot and easy access to taking it out. These looked like the best choice and the most secure and once installed I was completely satisfied. They were easy to install and took less than an hour. This rack is designed well with the suspension straps. We have not seen anything like it on the market and have been extremely pleased with how much thought went into this design. It’s simple (takes no space), and easy on the board. This company is clearly a quality company, personable and helpful. Great item, secured outdoors in stormy weather! I install 2 sets of Board rack to my boat with longboards and short boards in between and at 35mph had no problems. It was very inconvenient to keep putting the boards in and out of my boat cabin and with 7 people on the boat. We surf behind the boat All day long taking the board on and off the rack all day. Great product and way affordable. Easy to install, boards are protected. I'm happy. Will be ordering another set! We bought this rack for our SUP and attached it to our garage wall. We set it low, so that you don't have to reach up to remove it or put it back. It is sturdy, easy to use, and doesn't scratch up the board. We love the rack and recommend it! Quickly shipped and a perfect solution to my paddle board storage needs. Super easy to install. I had tried some other homemade solutions but this was the ticket! Thanks for a great product at a great price. This is exactly what I needed for my new SUP, it is perfect and I highly recommend it to anyone looking for a great, reliable SUP rack! Ordered this product after purchasing a Bote paddle board to hanging up in the garage . Product arrived on the date indicated. Box was totally trashed luckily the product was Not damaged are parts missing . Followed the directions to the T started off with the beverage of choice as indicated. Very impressed with the product. Thanks, damaged box no fault of the company. Highly recommend this product. These were really easy to install. They do a great job holding our boards and they look good too. We'll probably order another set soon. I used this product on the side of my pontoon boat, changed up some hardware drilled a few holes, works perfectly. We looked around for SUP racks to attach to our house to store and lock our SUP's, and these fit the bill. Our handyman had them installed in no time. Great service and item! Well made product that works well. My only comment is the lower hole demands a pretty acute angle (did use a 6" driver extension) to get by the front of the "U". To have a hole in that front portion of the "U" would give one a straight shot to the hole making it easier to mount on a 1.5" finished stud. What probably made it more difficult for us is that we mounted the Rack close to the floor so J could easily place and lift her SUP. These racks are great and we were able to mount them on a small deck down by the lake to hold my paddleboard. That way I don't have to carry it up and down the hill. Very sturdy/durable and perfect for mounting your SUP. Very well made product. Like the adjustable straps to help protect the finish on board. Mounted 2 of these side by side as seen in the photos on a stone wall. I used a masonry bit to drill the holes for the screws, drill bit size is indicated on screw box. I also added a washer on the screws for more stability. They are rock solid on the wall with this hardware setup. I have showed them to many people and they are impressed with the ease of mounting and also the construction and design of the board racks. In my opinion they work better when the boards are in the sleeve. Product is great. Hung with ease holds board great. Product arrived in great time. Company is great to deal with. This is a great rack and is easy to install and use! The SUP wall rack works perfectly. Easy to use. Saves space in the garage. Highly recommended. We bought this product for us to carry the board in a trailer. We mounted it on the roof instead of the wall for more space to fit our RZR ATV. I modified it by rapping the yellow metal in rubber tubing to prevent damage. But I didn't tie the straps down to the curved part and the board and it slipped out and scraped the bottom of the board on the roof of the RZR. I subsequently tied down the straps with a zip tie and that worked securing the board while in motion. Good product. Maybe supply alternatives to wall hanging and suggest my mods. It takes less than 10 mins to install one of these. About 15 mins to install two. Great space saver in my one car garage. I store two SUPs. Oh yes! this rack is the best... Suspension system saves rails. The bracket is wide enough to accommodate a SUP bag. High quality workmanship and materials. The design is super! Saw this at a friends house and I had to have one for myself. Works just like it supposed to work. Written by: Jerry p E.
Only took about 30 minutes to mount on steel post on my dock. Most time was used to determine proper location. Use self-drilling/tapping screws size #14 either 2 or 2.5 inches long. I predrilled the holes with a bit smaller than the #14 screw to prevent side creep of the self-tapping screw. Written by: Robert w H.
Very nice product. Well made, looks good, does exactly what it is supposed to do. Smooth buying process with StoreYourBoard. Great rack that supports board in non damaging way. Holds very large boards easily and securely. Install on lower bolts is a little tricky but overall straightforward process. Would recommend to anyone looking for flush wall mounts for SUP. The sling design of this product is excellent. Easy to install and secure. I used these to create a non standard storage for my inflatable SUP alongside a staircase in my garage. The end result is more than adequate and fits the bill. My wife can easily take it down and put the SUP away when finished. The box these shipped in was pretty rough shape upon delivery but everything was intact and all parts present. Overall very satisfied. I bought these to hang a 9'6" longboard that is quite heavy. These racks are sturdy, well built and easy to install. My only problem was that is was difficult getting the drill in alignment with the lower hole because the front hook of the rack interfered with the drill. The only way to overcome this is to drill that screw into the stud at an angle which I don't like doing. Does this come with 2 rack racks? Yes, it is sold as a pair - it will come with 2 rack arms. Does this rack have a method for storing the paddle as well? This SUP rack does have an optional paddle rack, that can be purchased separately, that can be seen and ordered here: Paddle Rack. It slips right on the SUP rack, without any tools necessary. Looking for a solid rack system to mount my paddleboard and surfboards to the side of my RV. Will these be sturdy enough to stand up to the induced drag of highway airflow? We have customers that have successfully used the Suspension Cradle Racks for transporting their boards on a golf cart, but we would not be able to recommend them for use on the side of a RV that is driving at highway speeds. Should your RV have any spare room on the inside, depending on its size, there might be a rack that could work inside. Can you use this product and drill it into a cement wall? Yes, our Suspension SUP wall rack could be mounted to a concrete or brick wall, but you would need to purchase brick/masonry anchors to do so, from anywhere that you buy hardware (Lowe's, Home Depot, etc. ), as it ships with standard mounting hardware only. You can find some additional general guidelines about mounting wall and ceiling racks here. Can this be mounted on a slant (a hip roof at about a 45 degree angle)? Is there something similar to this but can be locked? I need to have my SUP lock at my dock? Any ideas? OurSuspension Cradle SUP Rackhas mounting holes that are 4" apart, vertically. Assume you are mounting your board half up a wall. How do you grab the strap when it is below the board and you need it over the board? Your youtube does not show how to grab it to pull it over and secure it in front of the board. We have two videos on our listing for this SUP Suspension Cradle Rack, so maybe the other one might give you a better idea on how you can adjust and work with the strap, if you didn't check that one out. But basically, the board sits in one webbing strap, then there is a safety strap that goes over your board; it attaches to the webbing via velco; you secure that safety strap via buckles, to adjust it to a snug fit over your board. The safety strap will be running over the top of your board, so you will be able to reach it when removing the board, as well as when putting the board into the rack system. For where you hang the rack itself, since you are placing your board in and out of the rack, you normally want it at a level you can reach without too much difficulty, as far as lifting the board in and out - but the strap system itself is very straight forward. What is the width of the opening of the racks? I've got a 14' Downwind SIC board that needs 10" width when it's in the board bag. 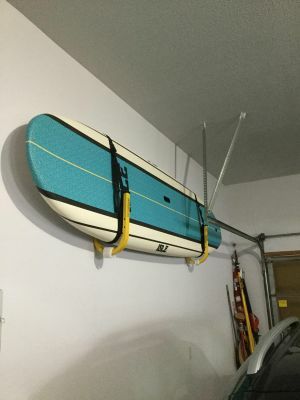 This wall rack has an 8" wide opening so unfortunately it will not work with your 14' Downwind SIC board since that is 10" wide with the board bag. We unfortunately don't have any comparable racks that would accommodate that width . We do have thisfreestanding floor rackwhich has several levels for storage of boards or kayaks if that would work in the space you have. 1- can this be drilled into an aluminum dock? 2- this is a floating dock and the wakes caused by passing boats make the dock rock quite a bit. Are these racks padded enough so it wouldn't cause damage to the boards? 3- I have a '16 Bote Rackham, a larger board. Will this fit in one? 1. This SUP rack ships with standard mounting hardware for securing them into traditional wall studs and beams/posts. 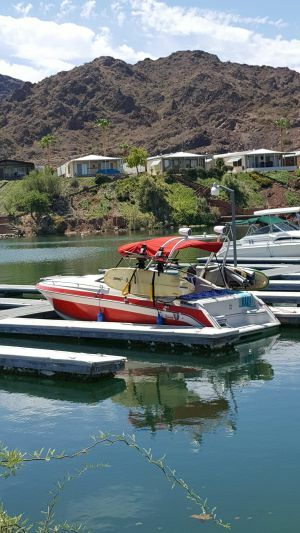 To mount it into an alternative surface such as an aluminum dock, you would need to obtain additional hardware/anchors suited for that dock, and I cannot recommend it would work well for your set-up as it may not mount properly to that docking; additionally, your subsequent questions raises other concerns. 2. Since it is a floating dock, there could be many issues to properly set it up to that docking, especially since it is subjecting the board to large wakes in your area. 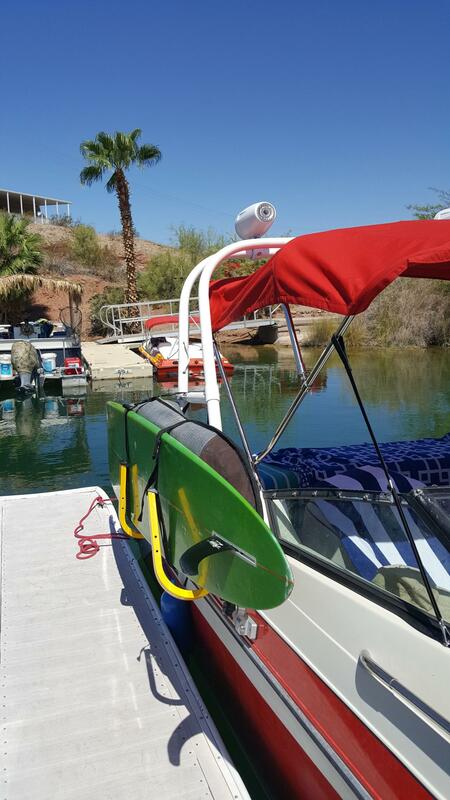 While the rack is padded and securely holds the board in a suspension cradle, use in a high-wake area could subject the board to damage and would not be recommended. 3. Regarding size of the board - the length of the board is not an issue, but it appears those model fishing SUPs are quite thick - and this SUP cradle rack only holds boards up to 8" thick. If you board is no thicker than that, it may fit into this SUP rack, but I am a little concerned that the shape of that SUP would not work right in this rack system so I would not recommend it. Will the rack work for a Hobie Eclipse peddleboard? How big of a circumference can the straps handle? 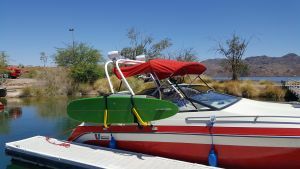 This Suspension Cradle SUP Rack can hold a board that is up to 8" thick; I don't know how thick the Hobie Pedal SUPs run, but I know they can be fairly thick, so you may want to look at that. The width - I am seeing some specifications that show those as being about 35" wide at their widest should otherwise be fine, as it can hold wide SUPs (I don't have the exact maximum unfortunately - but if it is not much more than 35 or so wide, it should be fine). Last, you may need to remove the pedal drive during storage, though there may be enough room to leave them in facing the wall -- and most likely would be removing the handlebars as well since those would be awkward to leave on in that position. So the main concerns are the thickness - if it is getting close to 8" thick it will be tight and then if it is much wider than 36 or so inches wide, I might start to be concerned it is not a good choice. Do you have a hinge so that while the SUP is in use, the racks can fold against the mounting surface? We have posts on our dock that are 9.5 ' - 10' apart with rope going through them for the railings. Is there a maximum distance between rack arms we should avoid? Our boards are roughly 10'6" long. That is a good question -- yes, for optimum storage of your boards, you usually want about one third (1/3) to one half (1/2) of the board inbetween the two rack arms, to distribute the weight evenly and hold your board securely.... so 1/4 to 1/3rd of the board would hang over each side of the arms in those scenarios. What that means is, for this Suspension SUP Rack, your posts at 9.5' to 10" are going to be a bit wide apart for storing a 10.6' board, and I really wouldn't recommend it., and you would want to look at alternatives. This suspension rack could possibly work to hold both your surfboards at one time. It can hold a board up to 8", so basically if in their bags they are no more than 8" total thick combined, it could work; then not in their bags, it sounds like they are under 8" thick together, so that works. I don't know how well it works with two boards in it, since it is primarily aimed at supporting one board, and doing so in a way that protects the board's rails from pressure points, etc. But I believe it could work. You will have less than 10" between the boards and the wall, so you may have to face the fins away from the wall depending on the length of your particular fins.